Identical to the bonus pack included with each Perilous Island book -- and now you can get them separately! Printed to closely match our premium Fortune Deck cards. 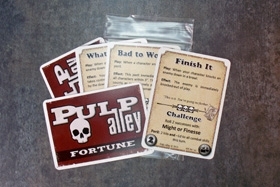 IMPORTANT NOTE -- This pack of cards is included for FREE when with the purchase of our Perilous Island book (#1003). Please, do not order this pack if you are also ordering our Perilous Island book, unless you want twice as many cards.